I got one hour of sleep. Maybe. I think. I think it was about 5:45 when I set the alarm for 7. But I “woke up” before the alarm went off on my phone. Why? Well, some inconsiderate a-holes honked their horn and then some people were smoking nearby. Yes, smoking. At a running event. Anyway, I was just laying there listening to numbers being called when I thought maybe I should see if anyone else is up. I peeked out. Alex (our driver) and Margot (The Faster Bunny) both appeared to be sleeping. I didn’t hear any movement from Lisa’s (Discovering the Meaning of Stonehenge) direction either. The other girls were in the van. Lisa took this excellent pic of the scene to the right of us. It was about 6:45 and I just decided to get up. 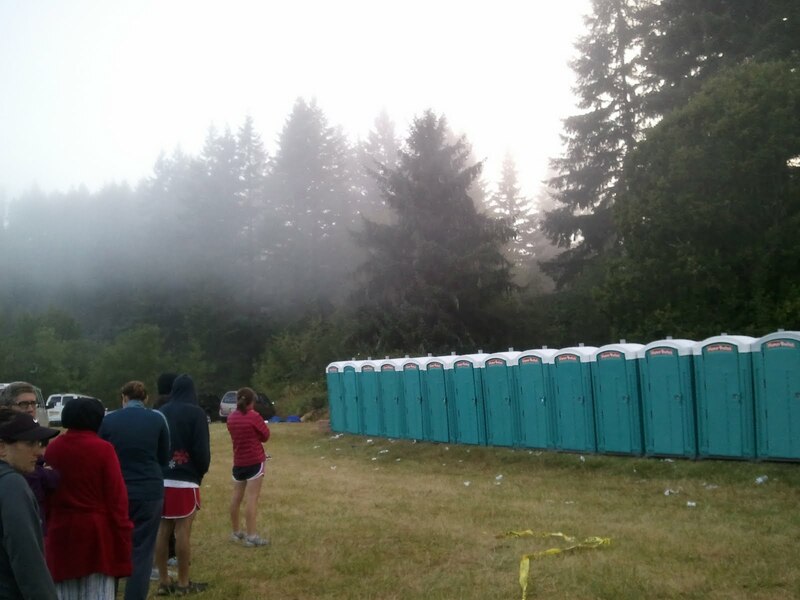 I went and got in line for the Honey Buckets, and gladly accepted a random roll of TP being passed down the line. I was cold and shivering in my capri sweat pant, light running zip-up jacket and flip-flops. The air smelled like wet weeds and hand sanitizer. It wasn’t long before I saw the girls from the van heading my way. I was relieved I wasn’t going to have to wake anyone up. By the time we got back from the potties, the other vanmates were up, and we all hustled to pack away our sleeping bags. Alex and Caitlin folded the tarp, which I was thankful for. I need to say it again, but our teammembers from Nuun were amazing. I don’t think either of them complained ever and they were fun and funny and calm, and just made the experience great. So thanks, guys! It was a little chilly, but now the sun was coming out. Tricia inquired about whether or not she’d be too cold in a long-sleeve shirt and her capri skirt, and I told her that she’d be perfect. In fact, I thought she might get too hot. Thing is…Tricia’s from Texas where it hasn’t been under 100 degrees since, like, forever. I’m from Seattle where it’s barely touched 80. 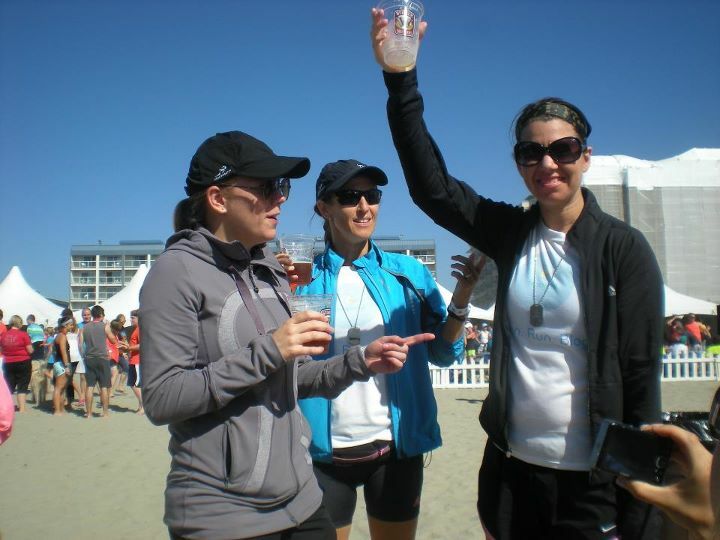 Her camo outfit from RunningSkirts was supercute; I love the shirt and capri skirt together! Plus, she totally blended in. Stealth Tricia. Tricia updates our “roadkills.” We never did put them all on. She passed off to Alyssa (Diary of an Average Runner), who was tired but pumped to run. Then it was Caitlin’s turn to kick some asphalt before handing off to me. I wore my marathon outfit for my final leg. These last routes were gorgeous — all on country roads, just passing through fields and by farmhouses or quaint bungalows. Next thing I knew, Caitlin was handing me the baton (slap bracelet) and I was off. It didn’t take me long to regret what I’d said to Jocelyn. Oops. Not really gradual. I thought about her waiting for Kim L. (Nuun) to come in and hoped when she began running, she wouldn’t think I was trying to throw her off or something. Hilly or not. I smiled the entire time. I was happy, and not just because it was my last leg and I felt “human” after only an hour of sleep. The country roads were beautiful and we’d caught up to many teams, so I was passing lots of people. I only got passed by one other person, which was nice. I went back and forth with a man in a wheelchair, I’d pass him on the uphill, then he’d pass me on the downill…over and over again. He was inspiring. The uphill looked really hard. The scenery was pastureland or large open yards. A few homeowners had lawn chairs and music going and were enjoying watching the race. I pushed myself pretty hard, and on a couple of the final uphills, I felt I almost crossed my “puke threshold.” I passed off to Margot and I was done. Once I stopped, I felt fine and wanted everyone to get back in the van so we didn’t miss Margot at the transition. The traffic was getting worse and worse. We got to the next transition with just a few minutes to spare, and Margot handed off to Lisa. After a couple miles, Margot hopped out to run with Lisa. Yes. She’s nuts. She ran with her for a bit, then hopped back in the van. How did they catch us? Well, traffic was really starting to back up. In fact, eventually we ended up just sitting and sitting and sitting in a back up. We started to get nervous Lisa would pass us and beat us to the transition. We had no cell service, so we had no way of warning Van 2 she was coming! I offered to “drive,” and Alex, who had been driving for a day with only an hour of sleep jumped out and ran a couple of miles to warn Van 2. I was glad he could stretch his legs and was happy to drive — I drove a bigger van when I was in a vanpool before, so it was no big deal. Also, we were going like 2. Alex barely made it and was able to warn the next van, we picked up Lisa and both photographers, then made our way to Seaside and the finish line. I couldn’t believe it. We were done. It was all over. We sat in a little traffic, but it wasn’t too bad getting to the hotel in Seaside, which was about a block from the finish line/party area. We dropped our stuff in the room, and made our way to the Nuun tent on the beach. We met up with our other Nuunmates, met Bob Foote (the creator of Hood to Coast), found our VIP bracelets and got a beer. Kim L., Alanna, and photo-bomb guy. So we were enjoying our adult beverages, when someone told us our runners were coming and we had to finish our beers quickly. So, we had a chugging contest. Who won? See for yourself. We were lucky in Van 1. 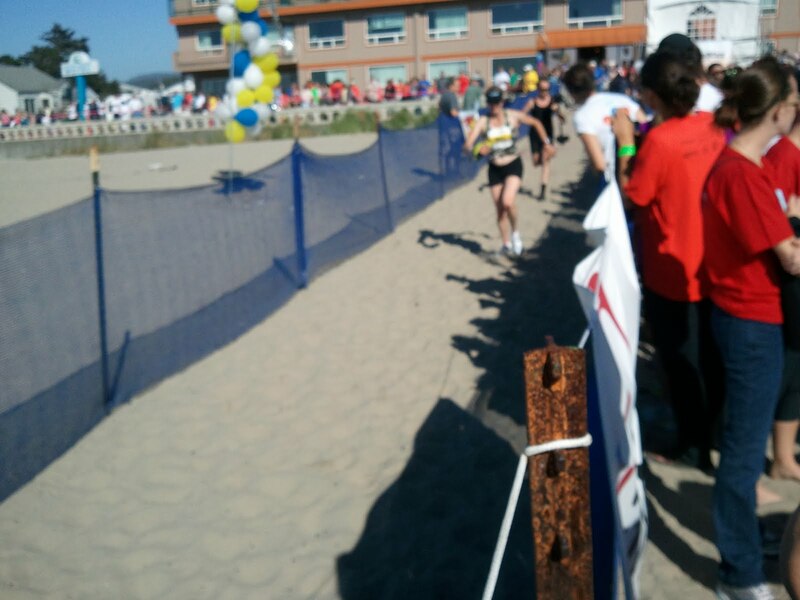 We got to see our teammate XLMIC (Taking It On) at the finish line! We made it in 27 hours and 59 minutes! 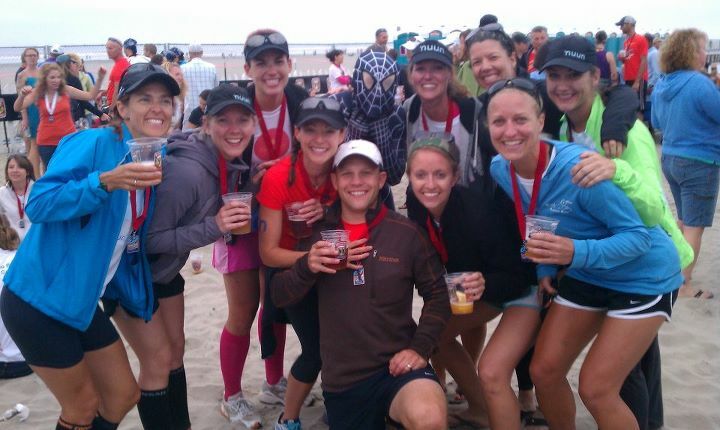 We celebrated with XLMIC, and then a few minutes later we got to see Megan finish for the other Nuun team! Then we celebrated again! I texted Mr. T too many times throughout the night saying we were celebrating. So he knew I’d had a few beers. No food + no sleep + sunshine + beer = a really silly Kerrie. But it was fun. Moms don’t get to do this stuff too often. We hung out on the beach being silly with Nuunmates from all vans. We also got to meet the lovely Amanda from Runningood and her hubs! Front: Waylon (Amanda’s husband), Susan and Jess. Finally, at 11 p.m., we all crashed in our hotel room. 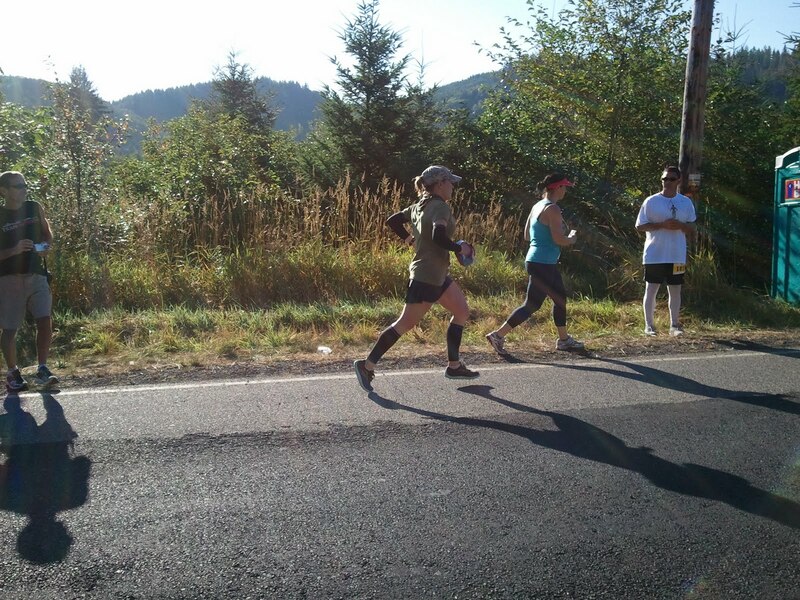 The Hood to Coast Relay was a race like no other. In fact, I’m not sure any other race will be able to live up to this one. I feel lucky that I got to experience it. I’d love to run it every year, but I’m not sure what the odds of that are. I think I covered the race okay, but maybe I missed something. Anyone have a question about the race? I’d love to answer it. 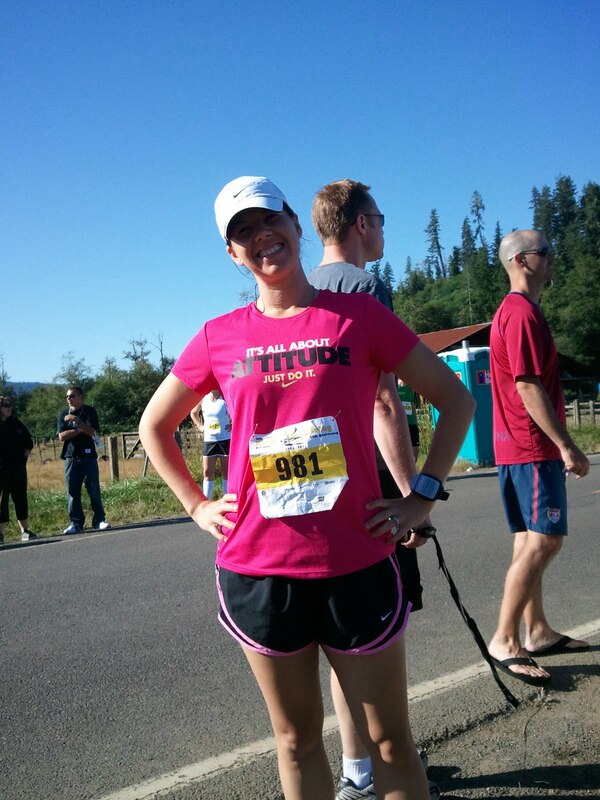 Okay, so next post will be back to business: sub-2 half training…only a couple weeks till race day!